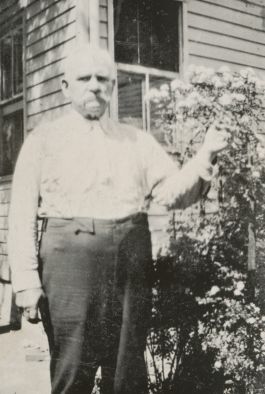 My grandfather, Samuel Dunning, was born May 30, 1857 and enjoyed a long career as a locomotive engineer. Based in Paterson, New Jersey, he held a coveted job: he delivered new steam locomotives to railroads throughout the western United States. He was employed as a traveling engineer by two of Paterson’s world-famous locomotive shops, the Rogers Locomotive and Machine Works and the Cooke Locomotive and Machine Company. He traveled throughout the country, and when my mother was a girl she would sometimes travel with him. He acquired photographs of trains and places he visited, and gave the photographs to my mother, who kept them all of her life. On these pages are some of my grandfather’ photographs. The brawny fellow posing before the locomotive in the photograph above is my grandfather, Samuel Dunning. This is my grandfather, Samuel Dunning, as I remember him. He often visited our house on Cedar Street in Paterson. In this photograph, he is posing with the rose bush my mother tended in our backyard. Our house on Cedar Street had a front porch from which you could see the tracks of the Erie Railroad. My grandfather enjoyed sitting on our porch and watching the trains go by. Surrounded by his grandchildren, he would tell stories of his days driving steam locomotives in the American west. To see portraits of my grandfather taken during his travels in the west, click here. To see correspondence written by my grandfather when he was General Inspector of Locomotives for the Texas & Pacific Railway, click here. 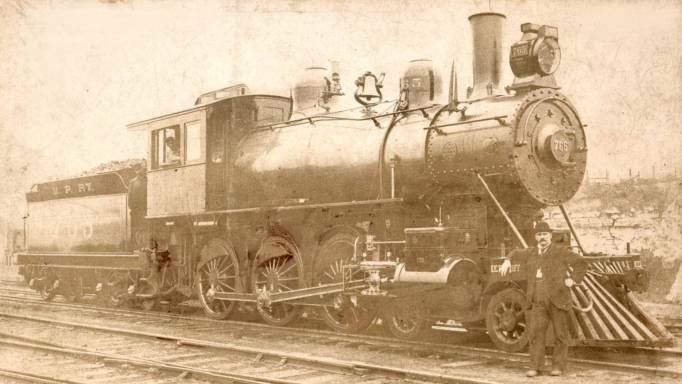 It is probable that this engine, which bears the markings of the Southern Pacific Railroad, was driven from an engine works in Paterson to California by my grandfather. Also in his collection is a commercially produced souvenir photograph of California bearing a handwritten notation stating that it was presented to him in Sacramento, California in 1907. The machine above is a rotary snow plow manufactured in Paterson, New Jersey. Rotary plows such as this were used to clear tracks in the mountains of the western United States. This photograph from my grandfather’s collection was taken by J. Reid, a leading photographer in Paterson at the turn of the century. As the photograph was taken in Paterson, the plow is apparently new, and must have just been painted with the markings of a western railroad, the Denver, Northwestern & Pacific Railway. It is likely that my grandfather delivered this machine, and others like it, to railroads in the west. At right is a detail from the photograph above.